Carolina-style slaw is made with a tangy vinegar dressing, a tasty alternative to coleslaw with mayonnaise dressing. The sweet and tangy dressing is cooked with seasonings and then poured over the shredded and chopped vegetables. The celery seeds add excellent flavor to this coleslaw, and the vegetables work well together. This slaw is the perfect topping pulled pork, barbecued beef sandwiches, pulled chicken or any other barbecue dishes, Carolina-style barbecue is typically served with slaw on top of barbecue sandwiches as a garnish. The absence of mayonnaise in the dressing makes the salad a good choice for picnics, potluck dinners, and tailgating. It's also a tasty side with hamburgers and charcoal-grilled (as opposed to barbecued) chicken breast sandwiches, and its vinegary flavor makes it a winner with fish and chips and fish tacos. Cut a slice off the stem end of the cabbage and set it, the flat stem end down, on a cutting board. With a sharp chef's knife, slice the cabbage into quarters, slicing from top to bottom. Cut the core out of each quarter with a sharp knife. Slice each cabbage wedge crosswise or lengthwise into thin strips, depending on how long you want the shreds. If desired, chop the shreds for a finer coleslaw or to add to soup. Shreds should be quite thin (around 1/8 inch) for coleslaw, thicker (1/4 to 1/2 inch) for soups and other recipes. 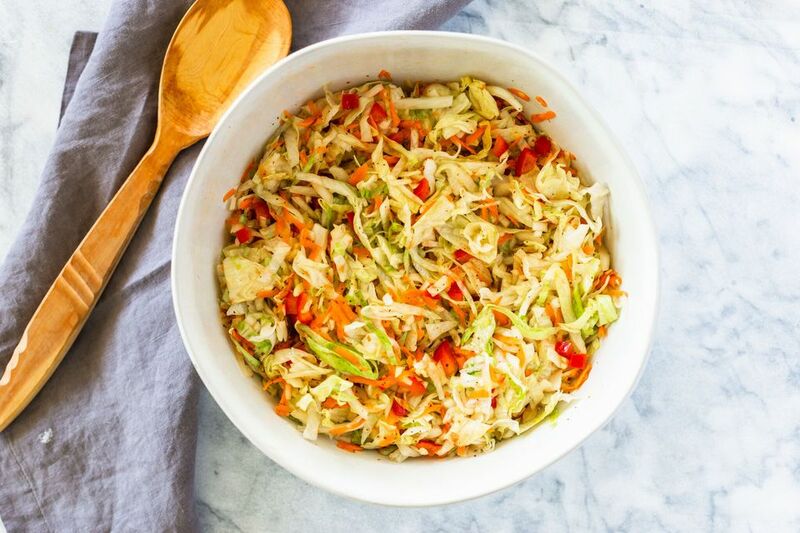 Combine the shredded cabbage, chopped bell pepper, and onions and the grated or julienne carrots in a large serving bowl. In a medium saucepan over medium heat, combine the sugar, salt, oil, dry mustard, celery seed, pepper, and vinegar and bring to a boil. Simmer, frequently stirring, until the sugar is dissolved. Cool slightly, then pour over the vegetables and toss well. Cover and refrigerate the coleslaw until thoroughly chilled. If you like a dressing that tends to the sour side, add the sugar to the vinegar mixture last, tasting as you go until you have the sweet-sour balance desired.